* 'Copy Filenames' - Copy file/folder names to the clipboard. You can hold down shift while selecting the command to copy the full paths instead. * 'Copy Filenames and Delete' - Copy the file name, and then delete the file. This is useful to replace one file with another, since you can follow it with the 'Paste Filename' command on another file. * 'Paste Filename' - Rename a file with the text on the clipboard. * 'Copy Filenames with Options' - Brings up a dialog that gives you lots of control over how the text copied is formatted, and also lets you add other file attributes such as size and modified date. You can also store presets to allow you to quickly select the formats you use most frequently. * 'Multi Rename' - Batch rename lots of files at once. * 'Extract Folder' - Remove a folder but not its contents. 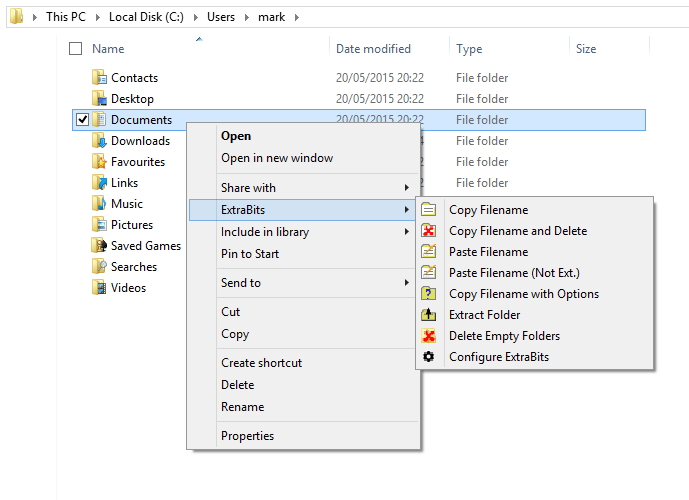 * 'Delete Empty Folders' - Find and remove empty folders. You can configure which of these commands are shown, and whether they are added to the main context menu or a submenu. Free for non-commercial use (100 selected items limit).